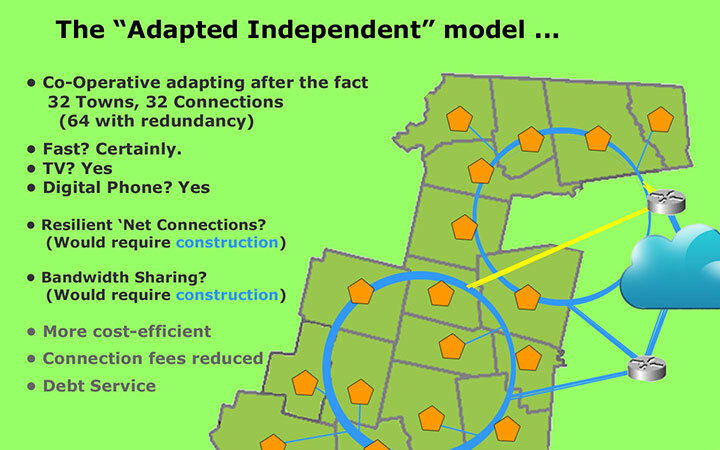 The OSP should be “fiber rich” with the standard recommended percentage of spare fibers to be 50% or more, depending on your town’s potential growth. Spare fibers may be used to connect to a regional network or for emergency services and future homes or subdivisions. 4 to 10 fiber strands should go to a mutually agreed upon border/demarcation/splice point(s) between each adjacent towns. 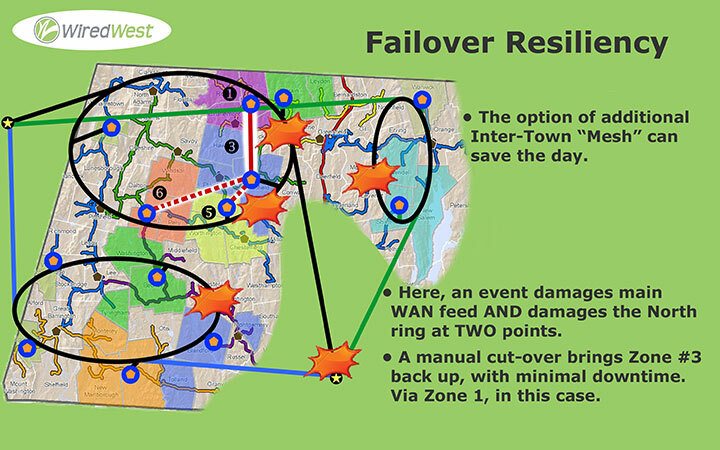 Also see Backhaul and Edge Cases for more information. 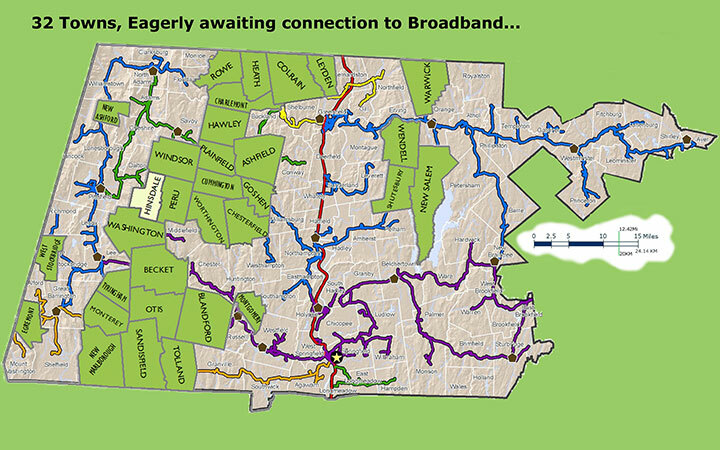 To join the regional network, towns would need to contribute a relatively small amount of fiber and equipment needed to connect networks. 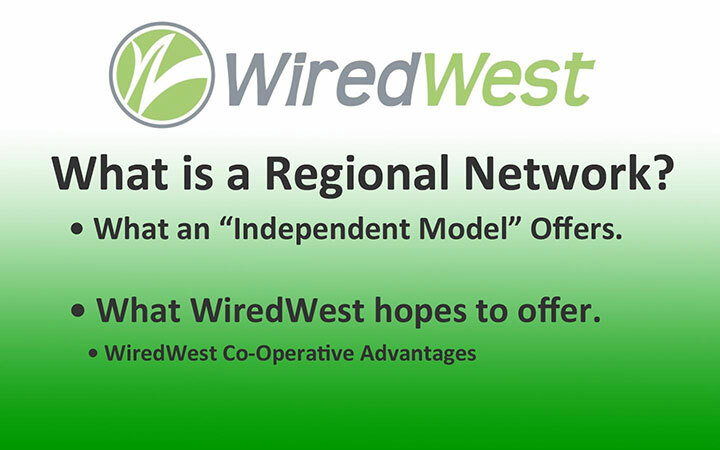 WiredWest would own only the assets necessary to connect the networks, however towns will maintain ownership of their complete individual networks. 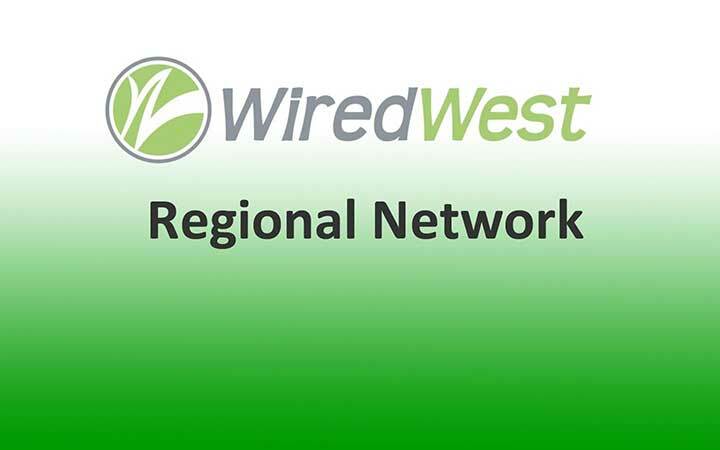 Towns will therefore be responsible for debt service and contribution to depreciation reserves, however as part of the regional network, WiredWest would handle maintenance, network operations, ISP, and other services. 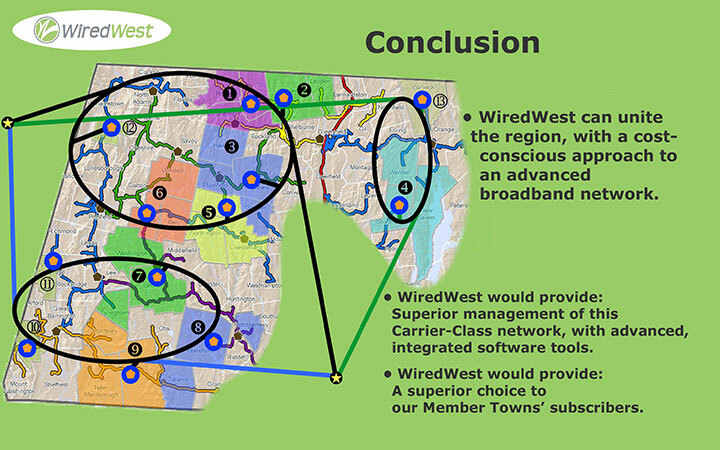 WiredWest will hire contractors for these services, sparing the individual towns of having to procure them separately. 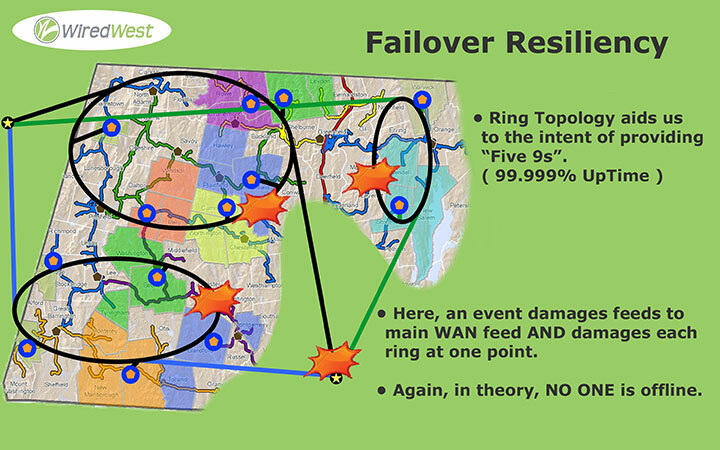 The network topology that we are considering would include a southern ring, a northern ring and possibly a Quabbin ring connected to the northern ring. 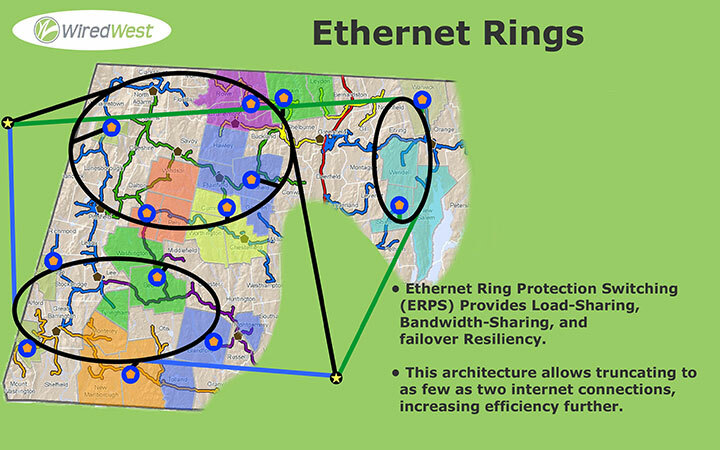 Each ring would use G.8032 Ethernet Ring Protection Switching (ERPS). This allows for the automatic routing of data on the ring if the ring is broken so that nodes after the break can still receive data. The southern ring would be connected through an edge switch to two 20 gig circuits to Springfield and the northern ring would be connected to two 20 gig circuits to Albany. One of the Albany and one of the Springfield circuits would be active and the other a spare. In the event that the active circuit was disrupted, the spare circuit would be activated automatically using ERPS. 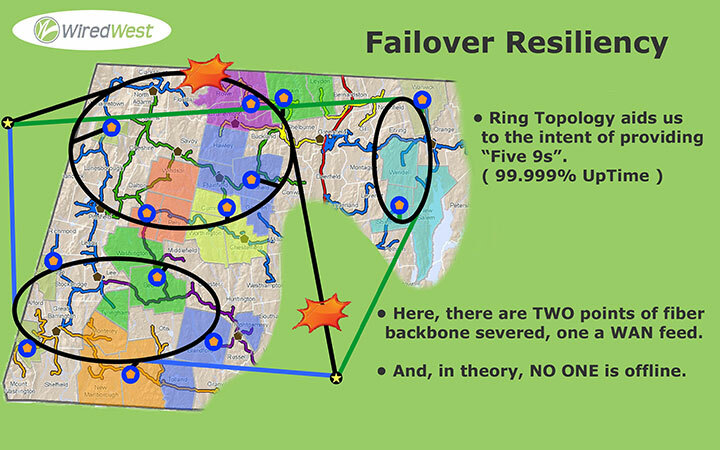 The two rings would be interconnected so that in the event that both primary and alternate from either Albany or Springfield were disrupted then both rings could be fed from the remaining city albeit at 20 gigs for both rings rather than 20 gigs for each ring. In addition to ring topology, the concept is to layer on mesh or fully connected network so that if a node (hut) became isolated by a break in the ring on either side of the hut, then the hut could be connected by a third path to another hut. The mesh or fully connected network would require a tech to manual connect the fiber in the isolated hut. 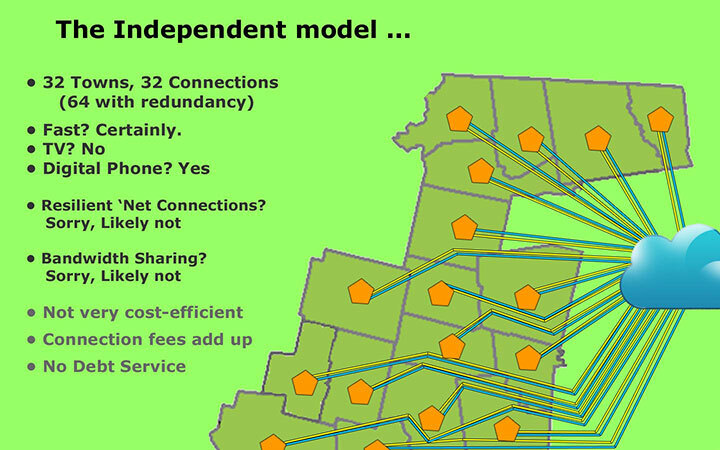 The details of the network topology will depend on which towns participate.